is the director at the Burbank Vargo PT clinic. He is a licensed physical therapist, an ASTYM certified clinician as well as a doctor of physical therapy. He is an orthopedist and a sports physical therapist. A California native, Dr. Comrie’s interest in sports therapy stemmed from his longtime passion for sport itself. After an ankle injury ended his collegiate soccer career at the University of California, Irvine, he turned his focus to completing his bachelor’s of arts degree in social sciences with a minor in biological sciences. An internship at the Tustin Rehabilitation Hospital solidified his interest in the medical field, which led him to enter into and complete his doctorate in physical therapy at Mount St. Mary’s College and to become a great sports physical therapist. Dr. Comrie’s clinical experience includes work at a number of outpatient physical therapy clinics as well as at Good Samaritan Hospital in Los Angeles, Kaiser Permanente Woodland Hills and Arcadia Methodist Hospital. He played a major role in the development of a project entitled Assessment of Community Resources and Needs for Pro Bono Physical Therapy, a research project which inspected the need for physical therapy evaluation and treatment in the underserved community of downtown Los Angeles. 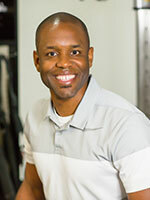 Currently serving as a Clinical Instructor at Cal State Northridge, Dr. Comrie has been a teaching assistant at Mount Saint Mary’s College of Physical Therapy as well as Clinical Instructor at Azusa Pacific University. He volunteers with the Los Angeles Christian Health Centers, which works to provide free-of-charge services to the underserved in the area. Dr. Comrie is married to a physical therapist and loves to travel and sing.